To further his fundamental research into solid oxide fuel cells and other high-temperature electrochemical energy systems, the National Science Foundation (NSF) awarded Professor Min Hwan Lee its prestigious Faculty Early Career Development (CAREER) Award. The grant brings the campus’s total to 20 recipients, but his award is the first for the mechanical engineering department. "This award is particularly special to us in the mechanical engineering program,” department Chair and Professor Jin-Qiao Sun said. “Min's work has helped to advance the program and enhanced the reputation of the university. We look forward to the further successes of Min's academic career at UC Merced." The NSF’s CAREER program showcases the importance the federal agency places on the early development of academic careers and aims to provide stable support for outstanding researchers and effective, committed educators. Lee plans to use the $514,000 that comes with the award to enhance his scanning-probe-based studies into electrochemical reactions that are critical to many high-temperature energy systems. 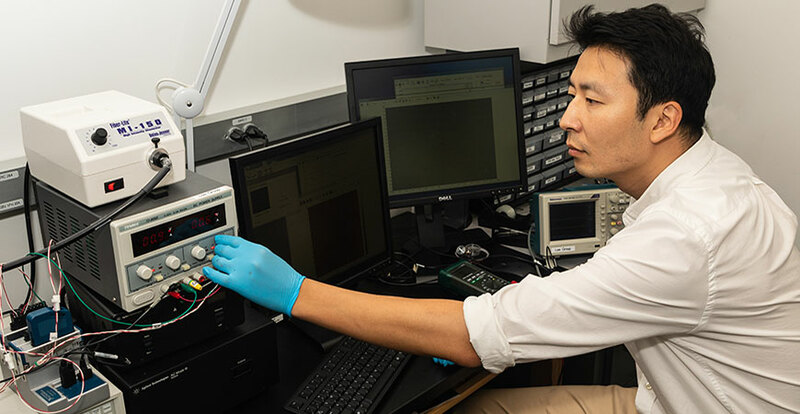 Solid oxide fuel cells have intrinsic advantages because of their high conversion efficiency, but there is significant room for improvement for performance and durability, Lee said. His lab works to overcome technical issues and to improve power and energy density, durability and economic feasibility. To do that, he and his students need to increase understanding of relevant electrochemical reaction in energy conversion and storage devices and to develop high performance, durable and cost-competitive devices through innovations in materials and design, including ionic batteries and supercapacitors.